I’ve recently rediscovered my love for user stories. While some projects call for a formal, more traditional approach with strict documentation, others call for collaboration and quick results. It is this latter approach that user stories were designed for. User stories are simple, clear, brief descriptions of functionality as described from the perspective of a user. Note: A User Story should not be mistaken for a Use Case. User stories in agile development can be useful to users and customers of the software. These user stories can then become the product backlog of an agile project. The simplicity of this template is important. I recently wrote about the Agile Manifesto, a guide to better interactions and collaborations. User stories production needs to be accessible to everyone and so this informal format helps to engage the entire project team to get involved. Writing these out on an index card allows them to be produced quickly, discussed, adapted and moved around based on priority. The first part of the card defines the Who, What and Why. But it’s not all the detail. This is where the conversation comes in. The conversation part of the story is an opportunity to elaborate on the details captured at the previous stage. In some planning meetings this will happen as the card is being written. In other cases this conversation will grow dynamically as both developers and clients understanding of the feature to be implemented improves. It allows for continuous dialogue around a feature, with the detail being recoded here. As a User, I want to upload a photo from my local machine so that any users can view it. As a User, I want to tag my friends and write a caption before publishing a photo to save myself time. In many case a card will go through an analysis or elaboration step prior to making it into development. It is often at this stage that the conversation section will be completed. I find it important to be as verbose as possible here, providing the developer with all the detail required to complete the feature. It is at this point I ensure that the card is duplicated into an electronic format. 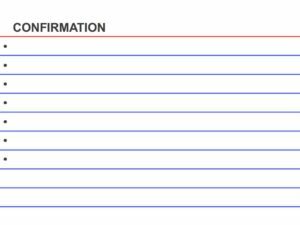 I have seen some good spreadsheets for managing stories but I favour ticket tracking software as it allows documents to be attached. These could be process flows, business logic, designs or wireframes. I keep the paper copy of the card and reference the ticket ID on it so that there is a link between the physical asset and the electronic copy. 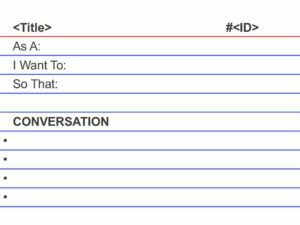 I use the following Redmine User Story Template to help me format my tickets. The confirmation part of the card is a space for a test case to go. These are steps or scenarios that help a developer test and a customer or user perform UAT. If your development team are undertaking Test Driven Development (TDD) these steps will form the basis of their test writing. Specify a picture file to upload. Check that .jpg, .png, .gif and .bmp extensions are supported. Check that other filetypes aren’t able to be uploaded. Check that files larger than 25MB results in an error. I try and write the confirmation parts of my story as I am having the conversation with the client or customer. Acceptance testing can allow you to limit scope of the feature and make you more confident in the estimate supplied. In the above card a requirement was captured for 4 different file formats. If your customer wants to change this in the future, agile allows for this, but until they do its part of the requirement that only 4 formats will be allowed. This allows us to define our Definition of Done, when all the conditions are met development can stop. Writing user stories can be quick and productive. It removes the overhead of detailed static documentation and makes way for creativity and collaboration. However, there is a lot more to user stories then just writing cards. Previously I have written about Measuring and Monitoring Velocity and my next post will be on Story Maps.